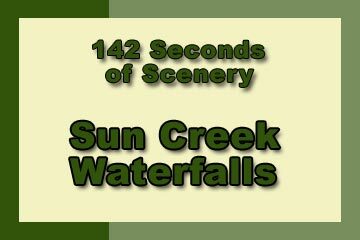 Sun Creek Waterfalls - Explore! 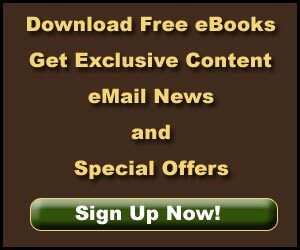 Sun Creek Waterfalls - Explore! 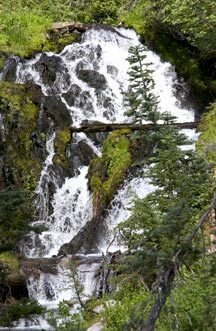 I was moved to explore the waterfalls on Sun Creek, in Crater Lake National Park, by the words of John Eliot Allen, a Ranger-Naturalist at the Park in 1935. He said one waterfall “drops over a mossy ledge for perhaps twenty feet, the angular blocky face of the rock breaking into a hundred jets. 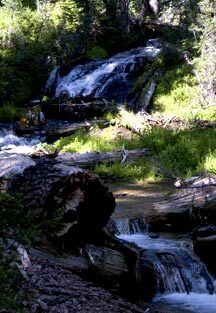 Half a mile further down there is another steep drop in the stream bed, and in two hundred yards the creek falls over three hundred foot in a series of cascades.” I set out to trace the course of Sun Creek from its source over these waterfalls. Sun Creek forms from a series of springs below the East Rim Drive at Sun Notch. The springs are fueled by snow melt that is trapped by gravel beds. The gravels parcel the water out over the summer months. From these beginnings, Sun Creek travels beside Sun Meadow, a favorite spot for elk, through a beautiful wildflower garden then under Grayback Road. The first two waterfalls that Allen mentions are between the road and the point where Vidae Creek enters Sun Creek, behind the Vidae Picnic Area. The waterfalls are accessible from both sides of the creek, but I kept my feet dry by not crossing the creek. I followed a poorly-maintained trail through the picnic area to Vidae Creek then followed that creek to the point where it joins Sun Creek. The second waterfall Allen mentions is just up Sun Creek from there. The 300-foot series of cascades begins a couple of hundred yards below this point. It is better approached from the other side of Sun Creek. 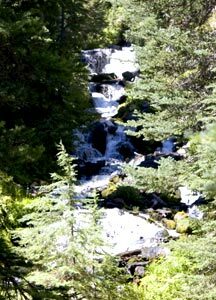 I walked up Sun Creek enjoying the waterfalls Allen mentioned as well as numerous cascades and rapids. I crossed the creek on Grayback Road. A hundred yards or so past the creek I came upon a well-established elk trail that I followed back downstream. As I continued on the elk trail, it angled away from the creek so I headed back to the creek through the woods. The banks are a bit steeper on this side of the creek, but the waterfalls are both easily approachable. The topographic map suggested that the climb down the big waterfall would be a bit easier close to the creek on this side. As it turns out, the bank immediately above the creek is very steep, but by following the creek atop this bank I was able to make an easy scramble down the rocky slope that creates the waterfall. As I walked above the creek, I began to wonder whether I would find a waterfall or just the series of cascades Allen mentions. Sun Creek was falling down the slope a foot or two or three at a time. About midway down the slope the cascades became very close together creating a great waterfall. I suspect it would be quite spectacular earlier in the year with snow melt massively increasing flow down the creek. It’s a little tricky getting a good view because of the steep slopes close to the creek. I was able to carefully select a path that got a nice view about a third of the way up the water fall. I continued downstream until I came upon a stream joining Sun Creek from the east. Both creeks have steep slopes so I came to the juncture well above the water level. The map suggested the possibility of another waterfall up this creek, but the flow was so small that I didn’t extend the adventure in that direction. Instead I looked around the flat above the creeks then enjoyed the view on the climb back up the hill. The scenery includes the forest, the creek, the waterfalls, the rocky slope that gets below the big waterfall, a scree slope just to the east of the rocky slope and even an expansive view to the east. That’s quite a lot of variety. It wasn’t much of an adventure until I got to exploring the big waterfall and the countryside below it. 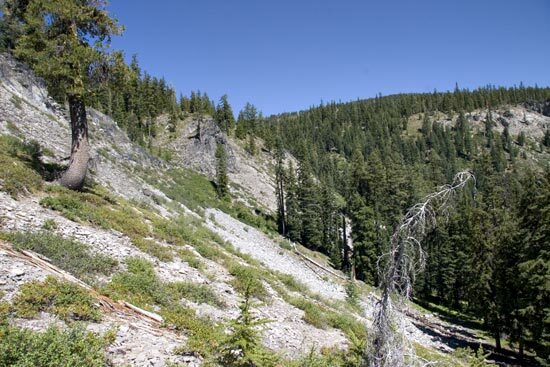 Climbing up and down the rocky slope offers the potential for injury. It’s probably not a good idea to travel alone here as no one is likely to come upon an injured person until the search parties are sent out. No one normally goes here and cell phone reception is non-existent. That adds to the adventure, even though the whole journey is within a mile of Rim Drive. No history is interpreted in this area, although we were apparently following in Allen’s footsteps. 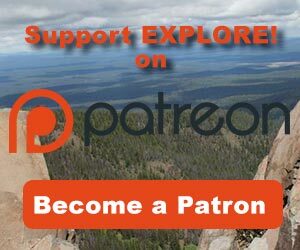 This would be a fun hike for kids. Just keep them away from unsafe footing that could cause them to fall down the steeper slopes. That’s only a problem adjacent to the big waterfall, but the kids would probably enjoy climbing around on the rocky slope. Overall, I rated this adventure a 5.6 out of 10. If you’ve been here, please add your observations by making a comment, below.